A calf muscle strain is a partial or complete tear of the small fibers of the muscles. 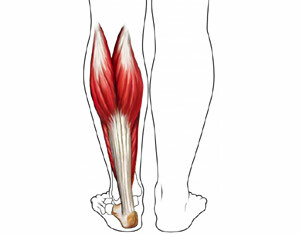 The calf muscles are located in the back of your lower leg. You will be asked about your symptoms and how your injury occurred. An examination of your calf muscle will be done to assess the injury. Images may be needed of the area if severe damage is suspected. Images may be taken with MRI scan or ultrasound. A physical therapist will assess the muscle. An exercise program will be created to help recovery and to stretch and strengthen the muscle. Armfield DR. Sports-related muscle injury in the lower extremity. Clin Sports Med. 2006;25(4):803-42. Campbell JT. Posterior calf injury. Foot Ankle Clin. 2009 Dec;14(4):761-771. Douis H, Gillett M, et al. Imaging in the diagnosis, prognostication, and management of lower limb muscle injury. Semin Musculoskelet Radiol. 2011 Feb;15(1):27-41. Muscle strain (pulled muscle). Johns Hopkins Medicine website. Available at: http://www.hopkinsortho.org/muscle%5Fstrain.html. Accessed February 26, 2018. Sprains, strains, and tears. American College of Sports Medicine website. Available at: http://www.acsm.org/docs/brochures/sprains-strains-and-tears.pdf. Published 2011. Accessed February 26, 2018. 1/4/2011 DynaMed Plus Systematic Literature Surveillance https://www.dynamed.com : Massey T, Derry S, Moore R, McQuay H. Topical NSAIDs for acute pain in adults. Cochrane Database Syst Rev. 2010;(6):CD007402.